Italian rabbi; born at Mantua in the latter half of the sixteenth century; died at Ferrara in the beginning of the seventeenth century. Possessed of great oratorical talent and having received a thorough secular education, he began while a youth to preach in the synagogue of his native town. His sermons attracted crowds of listeners, the more so as he introduced in his addresses quotations from Italian poets, and even went so far as to speak of "the holy Diana." This mode of preaching could not fail to antagonize the zealots, who raised a storm of opposition against the young orator. Israel Sforno put himself at their head, and petitioned the rabbis to excommunicate him. 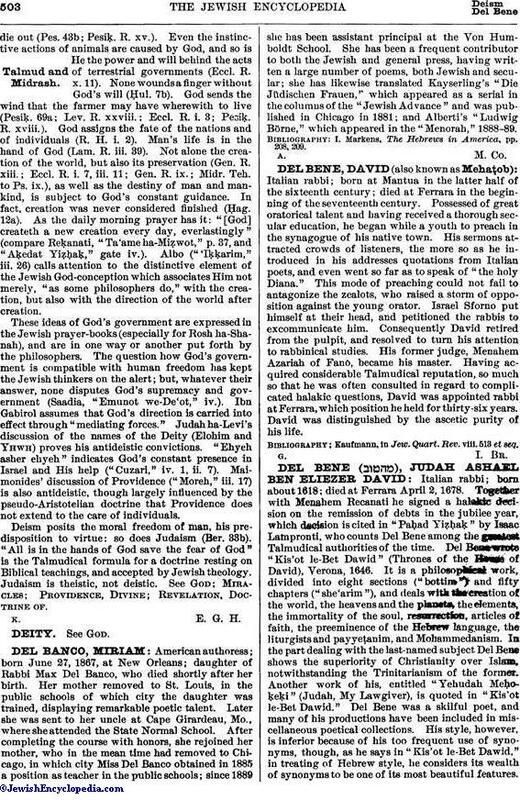 Consequently David retired from the pulpit, and resolved to turn his attention to rabbinical studies. His former judge, Menahem Azariah of Fano, became his master. Having acquired considerable Talmudical reputation, so much so that he was often consulted in regard to complicated halakic questions, David was appointed rabbi at Ferrara, which position he held for thirty-six years. David was distinguished by the ascetic purity of his life. Kaufmann, in Jew. Quart. Rev. viii. 513 et seq.